Around sixty photographs by Ed van der Elsken (1925 – 1990), Christer Strömholm (Stockholm, 1918 – 2002), Anders Petersen (Stockholm, 1944) and Lisetta Carmi (Genoa, 1924) illustrate the dark side of the metropolis, the life of citizens at the margins of the community. The four selected artists are key figures in Europe’s post-war photography. Ed van der Elsken, from Holland, told the story of the community of intellectuals and personalities who made the Paris Rive Gauche famous in the Fifties. Christer Strömholm tackled the equally legendary la Place Blanche in Paris between the mid-Fifties and mid-Sixties, where he photographed – in an objective manner and without any intention of causing scandal or surprise – the transvestites who lived and gave an infamous reputation to that area of the city. Some years later, Lisetta Carmi discovered the same subject in the alleyways of Genoa and tackled it with an extraordinary ability to avoid the rhetoric and prejudice that were so strong in Italy in the Sixties. 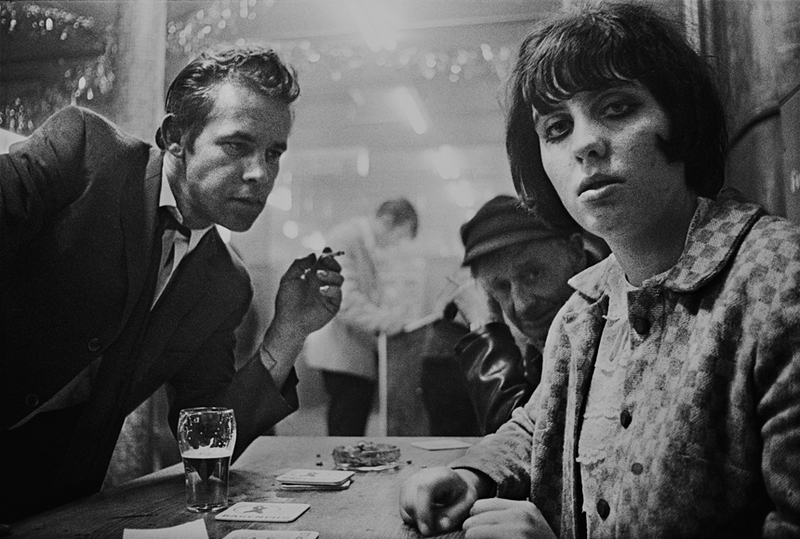 In 1967, the still very young Anders Petersen from Sweden photographed the customers of Hamburg’s Café Lehmitz, the meeting place of a down-and-out, albeit fascinating, humankind in the ill-famed docklands of the German city in the Sixties and Seventies. The exhibited works come from institutions such as Amsterdam’s Photomuseum and private galleries such as the Galerie VU in Paris, and are intended to provide a representative view of what has been photography’s vocation from its very beginnings, namely to seek out and bring to light how the “other half” lives – in the words of Jacob Riis from a book published in New York in the late Nineteenth century. At the same time, we should note that these artists had a distinctive approach to this topic in that they tackled the places and their inhabitants not with the detachment typical of the documentary approach, but by experiencing these situations from the inside and with a spirit in many ways close to that of keeping a diary. While the black and white images of Paris and Genoa may seem nostalgic today, when they appeared they actually caused a stir since they exposed and gave people familiarity with lifestyles and behaviour models considered scandalous at the time. And not only were they non-judgmental but they also clearly suggested that the photographers’ vision was party to and directly involved in the atmospheres of the depicted scenes. Despite the global fame of these artists, their works have never before been brought together in a single exhibit in Italy – an exhibit that clearly points to the surfacing of a cultural climate between the Fifties and Sixties that had a strong influence on the subsequent decade as well.